The Learning Tree is our newest project. It is based at Ganesh Puri just outside the town of Mapusa. The fact that it is close to Mango House means that the projects are run by the same expert team. From a small beginning we plan that the Learning Tree will support around 180 children daily. If you would like to visit the Learning Tree please contact Ashwini at Mango House on +91 988 126 1886. 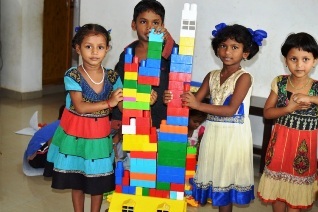 The Government registered pre-primary school opened its doors in June 2018 starting with an Upper Kindergarten Class of 25. 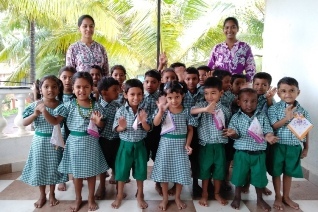 The school is an essential support to help prepare children to enter mainstream school. We teach the English and Marathi alphabets, simple words, numbers and counting, song and dance. The Government registered afternoon tuition classes started in 2016. They continue to steadily grow each year as a new intake moves up from pre-primary each year. Whilst we focus on education we know that good nutrition and a full stomach aids development and helps children to concentrate. 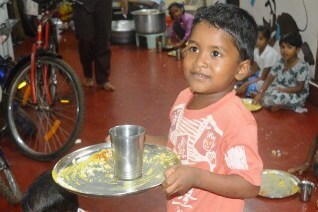 A meal is served to every child who can then go on to have seconds, thirds and fourths! We celebrate all the major religious festivals of the year including Easter, Holi, Eid, Ganesh, Diwali and Christmas. 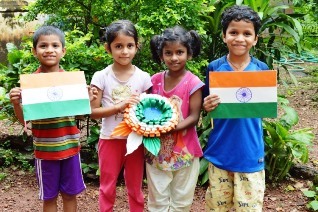 We also celebrate days of National Importance including Republic Day and Independence Day. A highlight of every month is the birthday party where all children join in to celebrate all those who had a birthday in the month. We believe that all children deserve a healthy educated childhood. 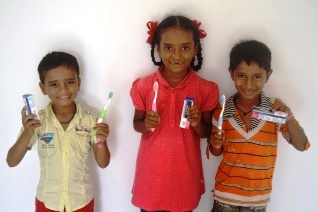 In order to help make this possible we teach children about good hygiene and ensure they brush their teeth after the mid morning meal. An essential part of every day is play time. We are lucky to be given so many wonderful toys by our visitors. If you could bring us some decent second-hand toys on your next visit please click here to see what we really need. 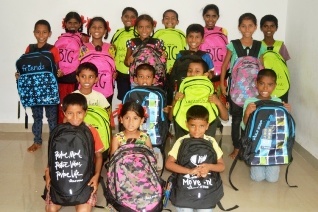 All children attending Learning Tree receive school uniforms as part of the Back2School scheme and a school bag as part of the Bags4Shool scheme. These things really matter to children. Click here to see why. A raincoat or umbrella can make all the difference in the monsoon. It's no fun standing in the rain waiting for the school bus and sitting in your wet clothes all day. Getting soaked contributes to fevers and chills and leads to absence from school. 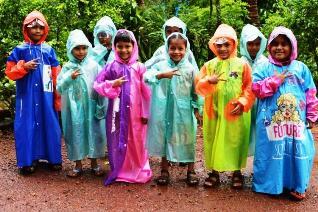 We provide raincoats to younger children and umbrellas to older children to stay dry in school.